I've been busy the entire day. 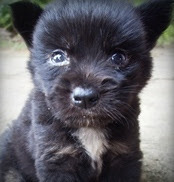 Early in the morning, I woke up with my mom holding a new black puppy from our neighbor. Apparently, she's already gotten over Shark's death. Looking at the black fluff ball, I remembered how much Shark had looked like the first time he'd been adopted by us. My mom told me our neighbor gave it to us because he wanted the dog to have a good home. I guess they had not known that this year, a number of puppies have already died in our care. We've spent a lot of time, effort and money on taking care of them but since their old owners aren't the type who cared much for their street dogs, we end up getting a sick puppy. Why not just refuse it? I've told my mom to stop bringing home puppies from her friends and neighbors, but the hoarding impulse always take over. It's unstoppable. We're calling him Bob. Bob is cute and worth $5 in medicine. He was traded for some over-the-counter paracetamol, antacids, decongestants, ascorbic acid and some others I'm not particular with. Since the owner was about to leave, he exchanged Bob for medicine he might need during his travel. This is not Bob, just a close look alike. I'll try to post some pictures of him when I get a decent photo.